Paul Mosenson, the founder of NuSpark Media, has been buying media since the mid-1980s. His wealth of experience and knowledge in planning and buying conventional and digital media is second-to-none. Below are some of the channels NuSpark Media can manage for your business so that you can spend your time doing what you do best. Paul’s expertise as media strategist contributed highly to our hospital’s branding campaign in enhancing positive awareness in the communities we serve. NuSpark Media has long-standing broadcast relationships that include everything from local and syndicated programming to regional and national networks. Leveraging these relationships will enable you to use broadcast mediums successfully to increase your brand exposure, awareness, and website/store traffic. We are fierce negotiators. We secure no-charge and heavily reduced spots, e-mail blasts, text blasts, sponsorships, special events, appearances, digital inventory and more to help boost exposure and results. TV remains the dominant player in advertising, with consumers watching more than four hours per day — but people sometimes delay viewing, using tablets and smartphones. 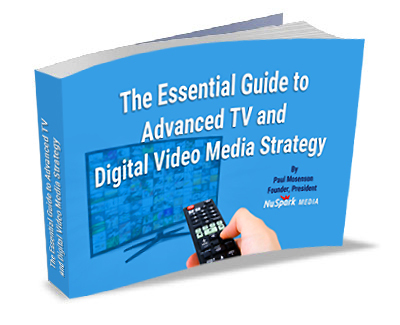 We plan television media plans for high impact while considering multi-screen behavior. With consumers listening to news and music everywhere from car radios to streaming audio, radio remains a compelling format for advertising. NuSpark Media combines years of experience in planning radio. We use the latest data on ratings and trends to build campaigns that drive brand lift and response. Newspapers, magazines, and trade journals can continue to be effective using the right message and cost-effective ad units. Our research enables you to precision-target the sources that are most relevant to your target audience. Outdoor advertising continues to have the highest reach of all mediums; and is best suited for brand awareness campaigns. Message frequency drives organic traffic to websites, and the visuals can be impactful. Contact us touch_app to build a comprehensive media plan that drives results.